One of the constants in modern football is that tactical trends will come and go with teams and analysts adopting the characteristics of whatever team or coach is seen to be in vogue at the moment. From the possession orientated style of Pep Guardiola and Barcelona to the counter pressing of Jurgen Klopp at Borussia Dortmund we have seen styles of play come and go in recent years. Now there appears to be a more refined understanding of what made that Barcelona team under Guardiola so successful with people seeing that possession was not the end game for the Spanish side but rather a means to an end in creating opportunities to penetrate the opposition’s defensive block and create goal scoring opportunities. This style of play has come to be known as Juego De Posicion or positional play. It is difficult to talk of positional play in general terms because there are so many aspects that come together to form this style of play. Instead for the purposes of this piece we will concentrate on the mechanisms needed to advance the ball and capitalise on superiorities that are created between the lines of the opponent’s defensive block. Rotation in the midfield in particular is a concept that has become more widely used at the top level of European football over the last 18-24 months. This provides patterns of movement that are intended to both offer support to the man in possession of the ball and create a passing lane behind the immediate line of pressure to allow you to play from an advanced platform and progress the ball towards the final third. I have chosen two particular teams for the purposes of this piece and whilst neither utilises positional play in its fullest form they both provide excellent examples of rotation as a principle for advancing the ball. Salida Lavolpiana is a concept within football that comes from the Mexican league where the legendary coach Ricardo La Volpe started to use this method as a means of progressing the ball out of the back and escaping from the first line of opposition pressure on the ball. The concept is a relatively simple one and indeed it has permeated in to the mainstream football media following its use by Guardiola at Barcelona in particular. As the team in possession looks to play out from the back the first movement is from the deepest midfielder who drops in between the two central defenders. This then allows the central defenders to split out wide in to the wide zones to effectively create a three man back line with excessive width. In turn these movements allow the full backs to advance forward to create another line of play in the wide area which in effect stretches the defending sides structure horizontally. As a final wrinkle to this concept another midfielder can then drop in to the positional slot vacated by the deepest midfielder when he dropped in to the defensive line to stretch the concept vertically and offer another passing option on the same line as the full backs. As soon as this concept is put in place the team in possession has numerical and positional superiority that allows the ball to be progressed from the defensive third to the middle third of the field with numerous passing angles and options available. This concept of moving positional slots and creating effective superiority in key areas of the field is one that has become much more common in the modern game. Here I have taken a clip from the match between Liverpool and Watford from this season to show how Liverpool try to progress the ball from the back against a side that are willing to press high. As Watford press forward and engage the defensive line as the ball is played out we see the deepest controlling midfielder for Liverpool drop back in to provide an extra option and allow the central defenders to split out wide. The ball is eventually progressed through the left sided centre back to a midfield player who has dropped in to the second line to offer a platform between the lines of the opposition’s pressure and then out to the left back who is able to access space down the left hand side. The passing lines in this clip aren’t necessarily the most clean but there are still enough options for the men in possession of the ball for Liverpool to play through the pressure from Watford without resorting to a direct pass in to dangerous areas of the field. We also see the lengths that Liverpool go to in order to facilitate their rotation with Sadio Mane coming in off of the right hand flank to provide the central passing option and enable the passing movement to continue. Again I should stress that in no way am I suggesting that Liverpool under Klopp utilise positional play in its entirely but the way that their players on the right hand side interact with one another is a fascinating case study that shows in part why Liverpool were so good in the attacking phase. The keys to the success that Liverpool had on this side of the field were Adam Lallana who played most successfully as a number eight on the right hand side of the central midfield three and Sadio Mane who lined up initially as a right winger but had the freedom to move across the width of the field to find pockets of space to exploit. Here I have drawn a simple diagram showing the key movements of the three Liverpool players involved in this rotation with three vertical channels shown. As Liverpool move in towards the final third they will look to occupy all three of these channels in order to maximise their passing options. The wide area will be occupied by the right back who has the freedom to advance all the way down the wide channel whilst the right winger will empty the space ahead of the full back by moving inside. Instead of the right winger moving in to channel 2 (the half space) he would instead most often cut across in to the central area whilst Adam Lallana would move from the central lane in to the half space where he could effectively support the play both centrally and in the wide areas. 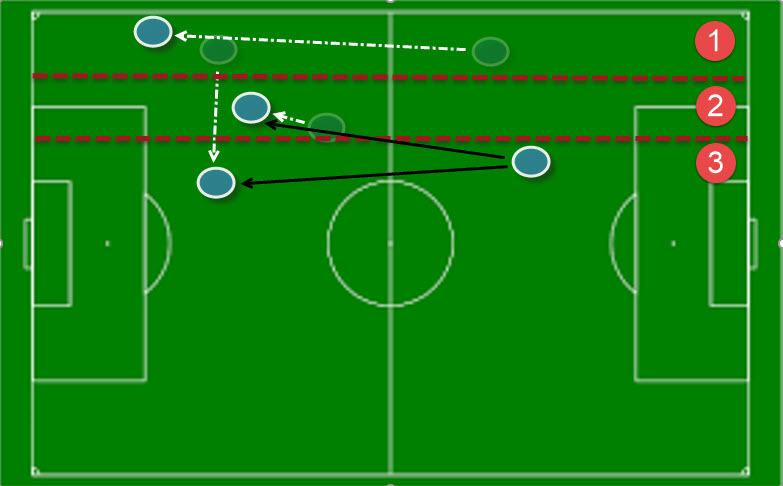 These rotations are designed to cause maximum disruption to the other teams defensive structure as Liverpool players rotate through spaces and channels. For my money there were few teams in football who were better to watch last season than Mauricio Sarri’s Napoli. The side from the South of Italy played a brand of progressive attacking football that went a long way to finally dismissing the notion that Serie A was a boring league to watch and as with Liverpool they used rotations to allow them to advance the ball through in to the final third although these were predominantly on the left hand side of the field. There are similarities in structure to the rotation used by Liverpool that I have described above but with a couple of subtle but significant changes. The two keys to this structure are Marek Hamsik and Lorenzo Insigne who combine superbly to facilitate the Napoli attack. The similarity between the rotations of Napoli and Liverpool are in the role of the wide defender who will control the wide area moving up the entire flank to provide width to the attacking movement. As with the movement from Mane for Liverpool we see Insigne move inside from the left hand flank towards the central areas, this is very much situational though with Insigne taking his positional slot from that taken by Marek Hamsik who primarily occupies the left half space and will drop in to take possession of the ball from the centre back. If, however, Hamsik retains a central position then Insigne will rotate around to collect possession. This added wrinkle to the mechanism of rotation makes it difficult for teams to mark the Napoli players as they transition to attack whether they try to pick them up man to man or zonally. Here we see Napoli trying to access the final third in their match against Internazionale. The opposing team has dropped in to a relatively passive medium block and we see Hamsik show for possession before playing the ball wide and then moving in to the wide advanced area. As Hamsik moves out of his initial positional slot we see Insigne drop in to take possession of the ball. Unfortunately instead of maintaining his position beyond the line of opposition press, Insigne drops slightly too deep and is forced to play the ball back instead of looking to turn and drive at goal. Here we see the match between Napoli and Torino as Napoli look to build up from their defensive area. As the play develops we see both Hamsik and Insigne drop in to their own half of the pitch and combine on the ball. As Insigne then drives forward from the half space in to the central area he opens up a passing lane for the ball to be played out to Ghoulam who is advancing forward from left back to take up an advanced position on the flank. These movements and rotations are effective in pulling the Torino defensive players out of position and releasing a Napoli player into space when attacking the final third of the pitch. Rotational movement can be used as a part of almost any tactical concept or structure and is not purely to be used when implementing positional play. That said with the right use of positional slots and movements a team can create passing lanes and platforms in advanced areas to allow them to operate largely in between lines of their opponents defensive structure. Whilst this is a concept that is used in positional play it also allows for the ball to be progressed forward efficiently. It will be interesting to see in the forthcoming season whether more teams look to implement rotational movement in to their attacking gameplan and whether any sides will evolve the concept further.